Between 1990-1994, the province saw downsizing the adult institutions including the Centracare and Restigouche deinstitutionalization projects. The deinstitutionalization process was very successful for hundreds of people who had been living in unacceptable conditions. However, it created tension between people (including Association members) who had, with little or no support, cared for their family members in the community and families who, for a variety of reasons were unable to care for their family members and placed them in an institution. Government, under pressure from the provincial association, provided services to bring people back to their communities thus creating two classes of service in the community. 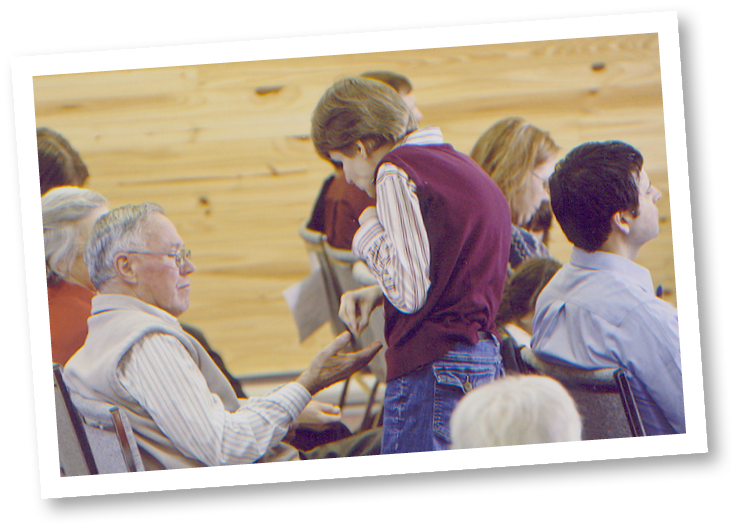 In 1992, NBACL was experiencing significant financial insecurity. Its primary source of funding was terminated and the Association was forced to lay off several staff members. The people in these positions kept in touch with local members, service providers and government officials and responded to local needs by providing information, connection to experts, training sessions and assistance with advocacy. NBACL also could no longer afford to pay for representatives to travel for provincial meetings or pay its dues to the Canadian Association for Community Living. The results were devastating to many locals that were already facing difficulties themselves. Myth: Individuals with an intellectual disability cannot live in their own home or apartment. Fact: In New Brunswick we have many individuals living in their own home or apartment with the proper supports. In 1992, NBACL began a yearly snow challenge; one of the main fundraises at Crabbe Mountain. This program lasted 10 years. THE LONG TERM CARE STRATEGY WAS ANNOUNCED. Social assistance was cut in ’95. This forced NBACL to focus its scarce resources on promoting better social policy and programs and fighting cuts. Most local members had a hard time relating their own circumstances with the social policy development and promotion and there was no money to involve and inform them of its importance. At the same time locals and other volunteer organizations were having difficulty attracting members. 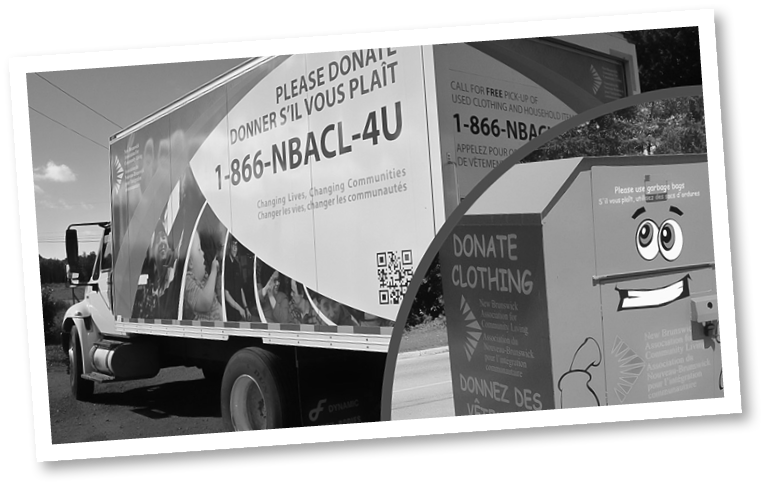 NBACL is one of two New Brunswick charities to partner with Value Village in this ‘recycling’ project. NBACL wholesales reusable clothing and household items to Value Village and the funds generated support the work of NBACL. For any additional information about the program and how you can be involved or help visit this link to our website to find out more. 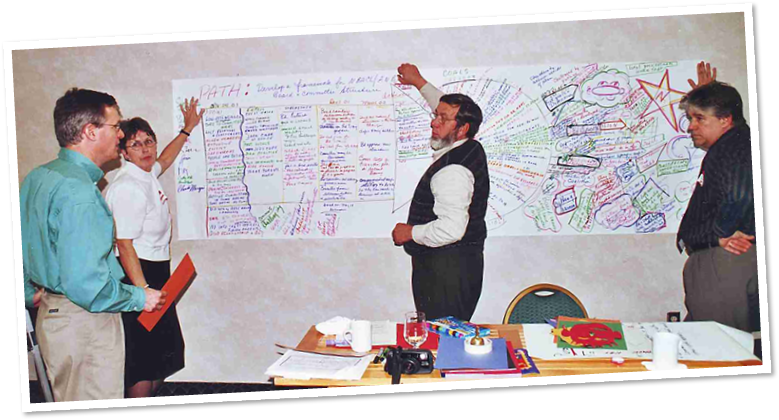 In 1997 the national Community Inclusion Initiative was launched by the Government of Canada. This pan Canadian initiative provided federal funding to the Canadian Association for Community Living and all Provincial and Territorial ACLs to develop local and national capacity to provide for the inclusion of people with an intellectual disability. New Brunswick's initial priorities focused on the development of community capacity to include people with an intellectual disability in recreation, leisure and volunteer opportunities in their communities. Funding for this initiative is still in place as of 2017. The Supreme Court of Canada hands down its decision in the Eldridge case. The Court ruled that adverse effects of discrimination are especially relevant in the case of disability. In this case, people who were deaf were denied a service offered to everyone (health care) because they were not provided with interpreter services. This case was about deaf parents that were not provided an interpreter when their child was taken to receive the care he needed. They were unable to know what was happening with their child because of the lack of interpreter. The Court ruled that discrimination can happen from a failure to take positive steps to ensure that disadvantaged groups benefit equally from services offered to the general public. 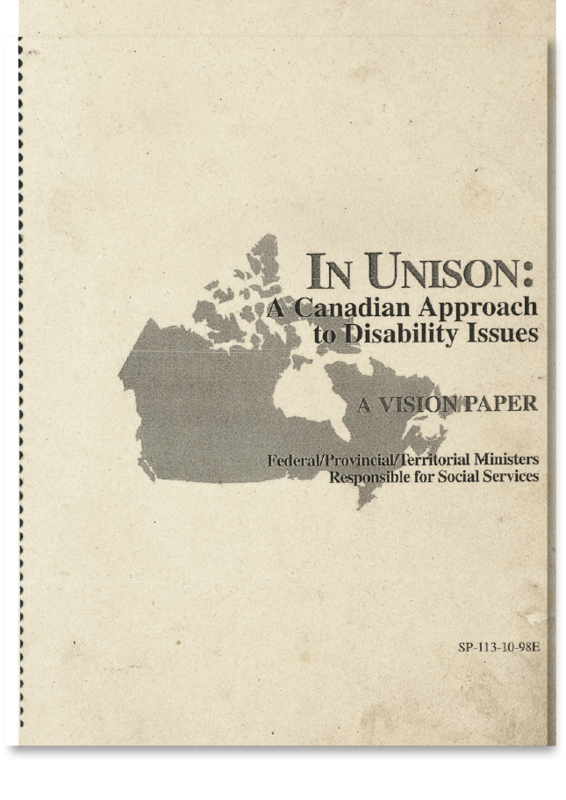 The Government of Canada releases In Unison: A Canadian Approach to Disability Issues. In Unison set out the vision of full citizenship and inclusion of persons with disabilities. A number of key recommendations for implementing this vision were set out at that time.